Looking for better mileage? lower engine RPMs? increased reliability? How about something that can do all that AND handle up to 1000hp? The stock RX-7 open rear is not very strong. It will get you from A to B, just don't abuse it. Spinning one tire with V8 power will soon be followed by grenading the spyder gears. The limited slip diff from a '79-'85 RX-7 is much stronger. It's a 4 pinion clutch style unit that looks much like a scaled down Dana PowerLock. With 4 gears engaged in the axle gears instead of 2, it's roughly twice as strong as the open diff. The '84-'85 versions have larger diameter axles, and reach their limit at around 350-375hp. If you plan to make more power than the stock rear can take, or need something w/ more ratio choices to reach your goals, we can help you out. We've sold everything from a 2.73 ratio 8.8 for a rotary powered land speed record car to rears for hi-powered turbo cars. Rotary or V8 power, ratios are available for most any application. 2.73 / 3.08 / 3.27 / 3.55 / 3.73 / 3.90 / 4.10 / 4.30 / 4.56 / 4.88 / 5.13 / 5.71 / 6.14 ratios are currently available. ...TracLoc clutch style limited slip, Eaton cone style L/S, E-Locker switchable locker, Detroit Locker, Tru-Trac Torsen, Race-only full spool. LEVEL 1- DIY Kit / Brackets Only... these kits are available for either stock or torque arm suspensions. 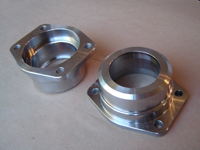 You supply the complete axle housing and installation labor. LEVEL 1- DIY KIT / Bare Hybrid 8.8 Housing Only... these housings are built as hybrids and are configured to accept 9" style axles. They are available for a stock suspension or our torque arm conversion. Does not include any internal gears/bearings/etc. You supply the internals and installation labor. LEVEL 1- DIY KIT / Axles Only... these axles are available in 4 on 4-1/2" or 5 on 4-1/2" lug patterns and 1st gen or 2nd gen brake offsets. Does not include bearings, but does include 12mm x 1.5 pitch lug studs (same as the original RX-7 studs). Available in 28, 31, or 33 spline at no extra charge. Upgrades to 1/2" or 5/8" long studs are available, as well as an option for being drilled for both 4 and 5 lug patterns on the same axles. 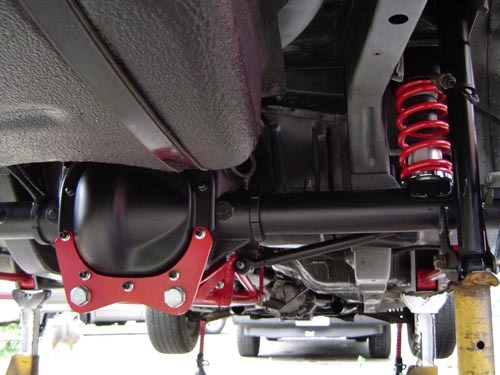 LEVEL 2- Stock Suspension... an 8.8 Ford axle custom built to bolt directly into ALL your '79-'85 RX-7's existing suspension mounting points, and uses your existing control arms and centering linkage. Includes installed brackets to use your existing GSL-SE calipers and rotors, no need to even bleed the brakes. Sway bar brackets are a no-extra-cost option. Even your existing e-brake is retained. 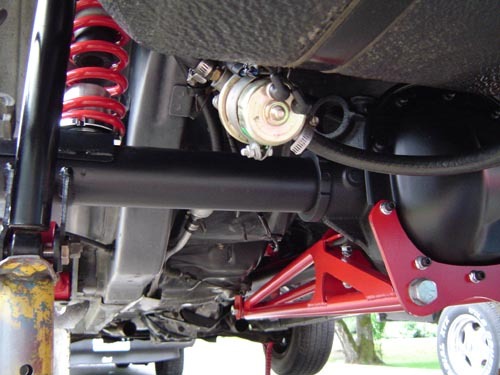 LEVEL 3/4- Torque Arm Suspension... an 8.8 Ford axle that uses your existing lower control arms and centering linkage, but replaces your upper link function with a torque arm. The result is a suspension system that plants your rear tires with just enough anti-squat to get the job done without wasting motion. The ultimate suspension for your street/strip car. LEVEL 5- Extreme Torque Arm Suspension... This is an Extreme version of our level 3 package for racing duty. 33 spline forged axles are standard, as well as a choice of either a 33 spline lightweight spool or an Auburn Pro differential. Flat spring seats are included for a wider range of spring rate choices. It includes our fabricated extreme duty 1-1/4" dia lower links, full kevlar lined rod ends for lower links, our fabricated adjustable watts linkage w/ kevlar lined rod ends, and an aluminum girdle style rear cover. ...Stock Suspension brackets only package price....................$395. ...Torque Arm Version brackets only package price................$1235. ...Bare Housing Only- Stock Suspension.................................$765. ...Bare Housing w/ Torque Arm Suspension............................$1395. ...Bare Housing & 9" Axle Package- Stock Suspension...........$1395. ...Bare Housing & 9" Axle Package- Torque Arm Suspension...$2025. ...Bolt it right in. Most do not even need to bleed the brakes. ...Easy Bolt-In Installation...Designed to bolt right to your existing lower links and uses your existing watts linkage. ...Get the ratio you want...2.73 / 3.08 / 3.27 / 3.55 / 3.73 / 3.90 / 4.10 / 4.30 / 4.56 / 4.88 / 5.13 / 5.71 / 6.14 currently available. ...Same 4 on 4-1/2" GSL-SE lug pattern w/ metric studs...you can use your existing GSL-SE wheels/tires. Optional upgrades to 5/8" racing studs or 5 lug 2nd gen Turbo II wheel pattern available. ...Stock GSL-SE rotors and calipers bolt right on...retain your existing e-brake...optional upgrade to 2nd gen RX-7 T-II brake brackets available. ...Standard with new 31 spline Track Lok clutch style locking diff...optional upgrades includes spool, Detroit Locker, Torsen, E-Locker. ...Rear rise instead of squat during accelleration. Lower 60' times / more forward traction from your tires. ...Torque arm design allows body roll during cornering. Roll understeer is built right in. Ladder bar & most common 4-link designs turn the rearend housing into one huge 3" dia sway bar, completely eliminating body roll, reducing your car's status to "drag-race only". Our torque arm design allows body roll, giving the driver important feedback necessary to perform consistant high-speed transitions. ...Use your existing rear springs / shocks. They just bolt directly to our brackets. ...Driveline loop feature included as standard equipment. Our 8.8 TA Packages come standard with Billet 9" style housing ends and Forged 31 spline 9" style axles- NHRA LEGAL- NO MORE C-CLIPS or LEAKY C-CLIP ELIMINATORS!!! 5.73 and a 1.304 60', street legal stick car, 175 shot nitrous, burning 92 octane pump gas. This car has had the engine moved back 10", but other than that, the chassis is completely stock, with the exception of two holes drilled in the top of the trans tunnel to anchor the nose of the Torque Arm. The only added material from the engine setback is 2pcs of 18ga sheetmetal about 10"x18" on the sides of the firewall to seal the modification. There is no rollbar, no added subframe connectors or any other chassis or trans tunnel stiffening. It uses a standard length Torque Arm, and our HD adjustable lower control arms and fabricated watts link, and adjustable Tokico shocks. Too quick to be a 1/4mi legal racecar without some track only safety upgrades, we're content to have just a quick streetcar driving to test/tune events. ...Torque Arm Assembly- This is the key component that controls the huge re-action forces of the rear axle, efficiently re-directing that force in a manner to increase rear tire traction during acceleration. We have settled on an effective length of 33" (45" available on request), and prefer to use rubber bushings at the front to help reduce peak impact loads on drivetrain components. 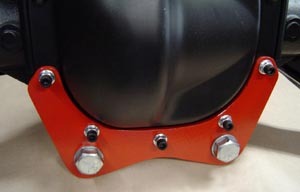 Using the 5 lower attaching points for the rear cover, a rear anchor plate takes force from the rear part of the housing, transferring that force to the lower tubes of the torque arm. To receive force from the nose of the rearend housing, we use a 3/16" plate that closely fits around the housing in the area of the front pinion bearing. A bolt-on lower section allows us to fit the torque arm's nose plate over the 8.8's pinion flange, allowing for easy assembly. By attaching the torque arm directly to the 8.8's center housing, we eliminate the need to weld the axle tubes to the rear's center section, a necessity if one were using a conventional ladder bar style setup. 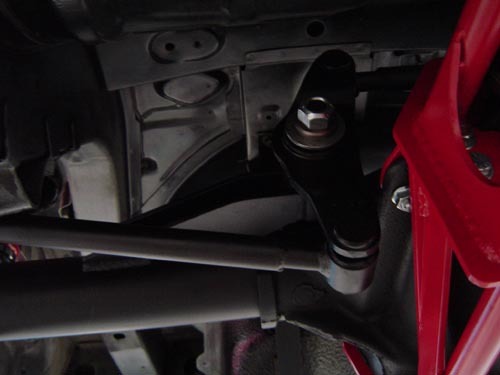 The nose of the torque arm sits in the center of the car, directly under the driveshaft, and is connected to the front yoke..
...Front Yoke / Driveline Loop- This is the actual component that connects the torque arm's lifting force to the RX-7's chassis. The yoke's design allows the driveshaft to pass thru it's center, feeding the torque arm's lifting force into the RX-7's chassis at a point nearer the car's center-of-gravity, above the driveshaft, into the top of the transmission tunnel. As the yoke completely surrounds the driveshaft, it also functions as a built-in driveline loop. The yoke is essentially a floating loop around the driveshaft, hanging from the top of the transmission tunnel, with it's lower part connected to the nose of the torque arm. For those looking to keep cost to a minimum, our TA conversion is also available in kit form. The kit allows you to locally source your own rear housing/differential/axles/lower arms/watts linkage (welding required to attach our brackets to your axle tubes). Here's a couple of pictures of a 1st gen RX-7 TASA conversion...while our system uses the same lower control arms, we completely eliminate the upper arms of the RX-7's stock 4 link, allowing us to narrow the rear significantly, making it possible to use easier to find wheels with less backspace. 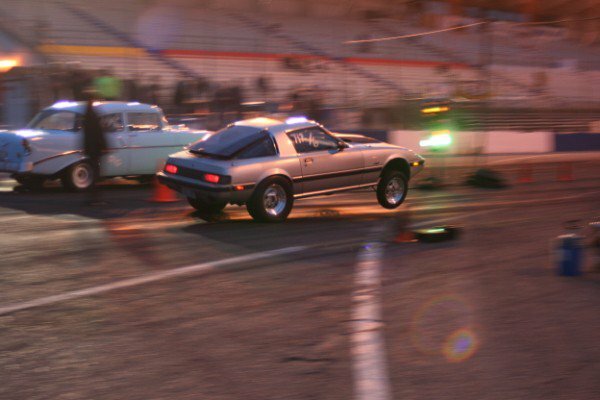 For the 1st gen RX-7, we offer a smaller diameter coil spring option with threaded sleeves for adjustable ride height. Many spring rates are available. The larger diameter of the 8.8 center section requires an adjustment to the length of the watts link's "links" to properly center the rear under the car. We supply sleeves that have the inside diameter perfectly sized, making it easy to simply salvage the original link ends for an economical solution that requires minor welding.